Missouri’s water consumption declined in 2010. The decline was smaller than the decline for the nation as a whole, and it may be due to economic factors rather than conservation. Missouri is not one of the regions of the country where water supplies are most tightly constrained. Thus, Missouri is not under as much pressure to reduce consumption as some states are, California for instance. Nevertheless, water consumption is an important environmental variable, and it is useful to know what the trends are in Missouri. The data for this post comes from the U.S. Geological Survey’s Water Use Data for the Nation data portal. The portal’s data for Missouri extends back to 1985. Figure 1. Data source: USGS Water Use Data for the Nation. 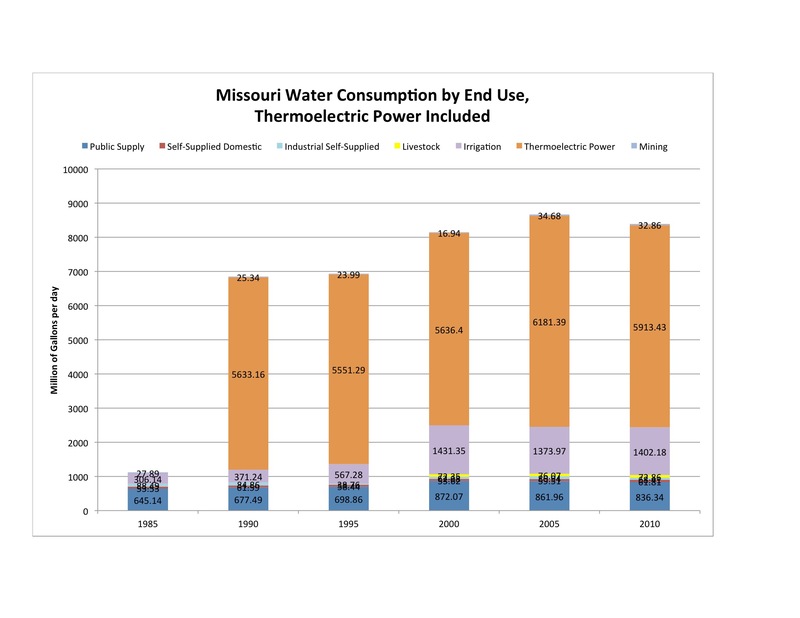 Figure 1 shows Missouri’s water consumption by end use, including thermoelectric power, for 1985-2010. Missing data makes comparisons across years difficult: data for thermoelectric power is missing for 1985, and data for livestock is missing for 1985, 1990, and 1995. With those caveats, Missouri’s water consumption appears to have increased through 2005, and then declined slightly in 2010. This contrasts with national consumption, which peaked in 1980. The decline in 2010 may represent the beginning of a trend, but before assuming that it does, recall that 2010 was during the depths of the Great Recession, and the decline in water consumption may be related to a decline in economic activity, not conservation efforts. Thermoelectric power is by far the largest consumer of water in Missouri. Missouri’s largest power plants (Labadie, Iatan, Thomas Hill, Rush Island, New Madrid, Sioux, Hawthorne, Meramec, and Callaway) are all located on rivers or reservoirs, and they withdraw water for cooling and for making steam. Thermoelectric water withdrawals peaked in 2005 at 6,181 million gallons per day, and declined in 2010 to 5,915 million gallons per day, a decline of 4%. Irrigation was the second largest consumer of water in Missouri. The peak year for irrigation consumption was 2000 at 1,431 million gallons per day, and it was about 2% lower in 2010 at 1,402 million gallons per day. 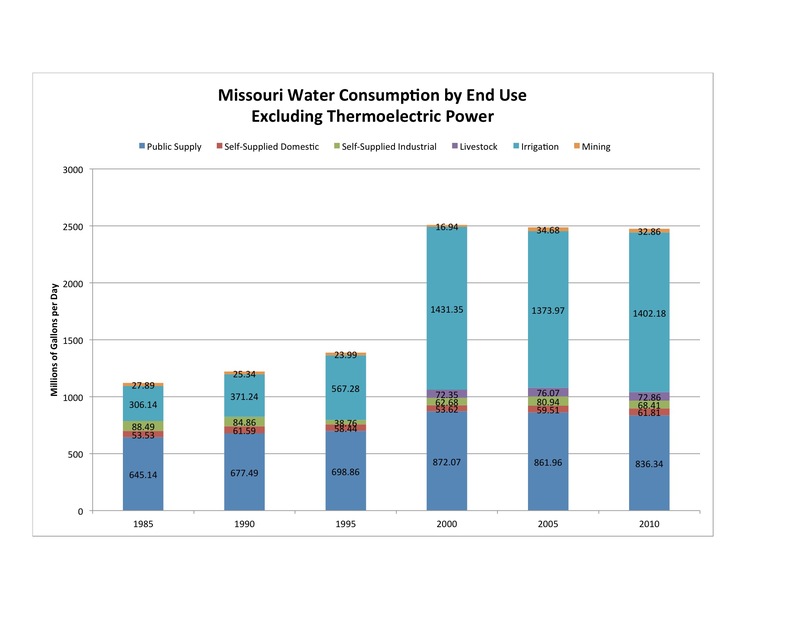 Figure 2 shows Missouri’s water consumption by end use with thermoelectric power excluded. I think that thermoelectric power is not a proper end use for two reasons. First, most water withdrawn for thermoelectric power is used for cooling, and it is returned to the environment. When returned, it may cause local problems because it is hot, but generally it is not contaminated. Second, electricity is not generated for its own use, it is sold to customers for their end uses. Thus, it may be useful to understand Missouri’s water consumption with thermoelectric power excluded. Once thermoelectric power is excluded, irrigation and public supply become by far the largest consumers of water in Missouri. Irrigation was discussed above. Public supply represents all water that is delivered to customers by a public water utility. Here, things get a little complex. Some domestic and industrial water consumers supply their own water themselves. These consumers represent a small fraction of the total, and are shown on the chart in red and green. Most domestic and commercial consumers, and some industrial consumers, are supplied water by public water utilities, and these are the consumers represented by the dark blue public supply category on the chart. Both irrigation and public supply peaked in 2000, and by 2010 had declined 2% and 4% respectively. Because the trend is consistent from 2000 to 2005 to 2010, I am less inclined to suspect it is a function of the Great Recession. Stacked column charts are great for showing categorized data over time, but pie charts show more dramatically the percentages belonging to each category in a given year. 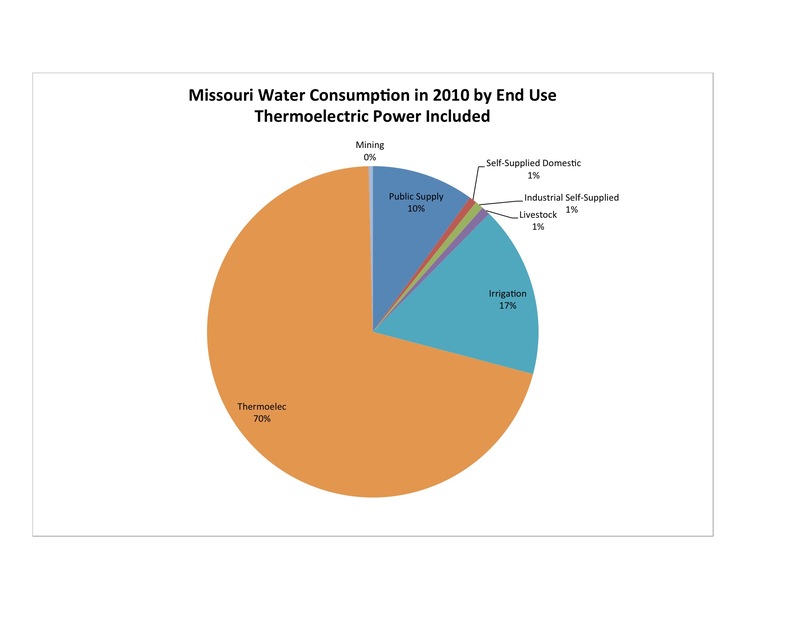 Figure 3 shows Missouri water consumption in 2010 by end use, thermoelectric power included. 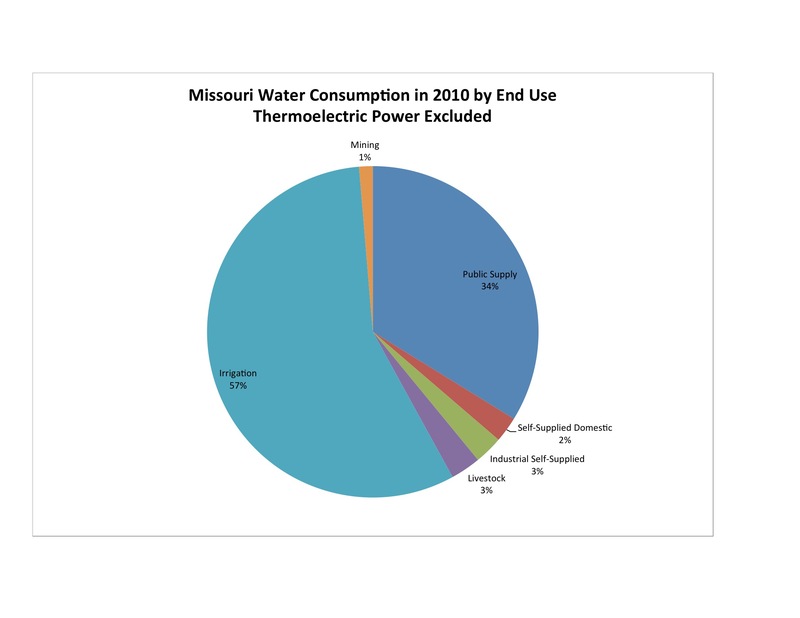 It shows that thermoelectric power accounted for 70% of all Missouri water withdrawals. Irrigation accounted for 17% and public supply for 10%. Together, the three accounted for 97% of Missouri water withdrawals. Figure 4 shows the same data with thermoelectric power excluded. If one considers thermoelectric power withdrawals a non-consumptive use, then irrigation and public supply together accounted for 91% of the water consumed in Missouri in 2010. Because of the drought in California, I have also been following water supplies out there. I will post on California’s water situation after the start of the new year. U.S. Geological Survey. 2014. Water Use Data for the Nation. USGS National Water Information System. Search criteria: Years 1965,1970,1975,1980,1985,1990,1995,2000,2005,2010; Area UNITED STATES; Catogory ALL. Data accessed 12/3/2016 at http://waterdata.usgs.gov/nwis/wu. By mogreenstats in Consumption and Supply, Water on 2017/01/05 .